And then there is the mysterious chimney breast at Mount Ievers, dated 1620, which gives the name “IOHN IEUERS” alongside the unexplained letters approximating to E’ S MR. Who on earth was this chap!? And what is a chimney breast dated 1620 doing at Mount Ievers given that most sources suggest Henry Ievers did not settle in County Clare until the 1640s? Did the chimney breast come from somewhere else and, if so, where? Another factor that should be born in mind is that when Henry’s eldest son and namesake Henry Ivers became the father of a boy in 1662, he named his child Ambrose Ivers. The London Church Registers record the marriage of a man called Ambros [sic] Ivers to Anne Barlowe which took place at St Matthews, Friday Street, London, on June 15th 1578. [ii] There is also a Richard Ivers who married Hellen Sharman, on September 27th 1599, at St. James’, Clerkenwell. Could these be clues to finding a London-based Tudor ancestor of the Ivers? In any event John Cooper was in possession of the lands of Tarbert, County Kerry, in 1666, when these lands were seized by Thomas Fowle in lieux of money owed. Laurence Steele, Fowles’ executor, subsequently let these same lands to Henry Ivers for £100 per annum, to be paid at Strongbow’s Tomb in Christchurch Cathedral. His second wife, Elizabeth Deane, was a daughter of Joseph Deane, Chief Baron of the Irish Exchequer, whose grandfather had been a close ally of Oliver Cromwell. 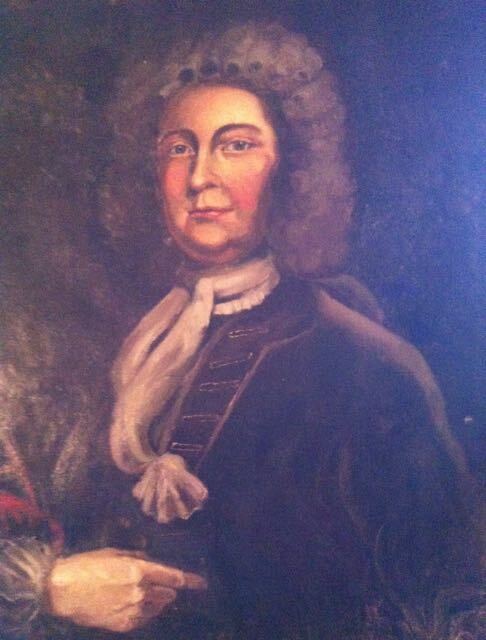 In his later years, Sir Donough moved from Lemeneagh to Dromoland where he died on 19th November 1717, aged 76. He is recalled by a handsome Corinthian monument in the Church of Kilnasoolagh in Newmarket. In 1641, the Catholics of Ulster launched a rebellion and the Confederate Wars commenced, pitting a fragile alliance of Irish and Anglo-Norman Catholic against the forces of English and Scottish Protestant Republicanism. Head-quartered in the Butler stronghold of Kilkenny, the Confederate forces produced many admirable victories, but were ultimately unable to sustain the pressure. Cromwell’s brutal suppressions of the garrisons at Drogheda (with Isaac Ewer at his side) and Wexford overwhelmed the Confederacy. Limerick City was amongst the last of their strongholds to surrender; the Fannings of Ballyarrilla (alias Mount Ievers) were to pay the ultimate price for their resistance. The collapse of the Confederacy enabled Cromwell to proceed with the confiscation of all property belonging to Catholics accused of complicity in the “rebellion”. These lands were duly granted to soldiers who had fought in his victorious wars against the Royalist forces of King Charles I and the Catholics in Ireland. According to Robert O’Brien, writing in 1871, there were ‘still visible some foundations of the old castle but most of the stones were worked into the modern mansion house’. The mill later passed to the Pease family and was to play a pivotal role in providing the Dutch red bricks for Mount Ievers in the 1730s. Illustrated by the English schoolmaster Thomas Dineley when he passed by in 1680, it is not known who originally built this tower house, nor when. No records of its construction survive, but it was probably built around 1470, in common with other local tower houses. By 1580, it was the property of Bryan Mac Namara, son of Daniel Roe. Dominick Fanning was to lead the citizens of Limerick in their resistance to a six month long siege by Henry Ireton’s Parliamentarian forces, displaying remarkable personal fortitude and vigour. However, all fell apart when Colonel Fennell, ‘an Anglo-Irish officer of ability but of depraved character’, was entrusted by General Hugh Dubh O’Neill with the task of defending the important pass of Killaloe. Presumably fed up with the siege, Colonel Fennell promptly turned his guns against the city and Limerick was obliged to surrender on 29th October 1651. The garrison was allowed to depart to Galway which was the nearest fortress still held by the Irish. Shortly after the surrender, Colonel Fennell was tried for several murders and other high crimes, found guilty and hanged by his new friends. Dominick Fanning hid in the tomb of his ancestors in the Franciscan Church but, utterly famished and frozen stiff, he was drawn out when a body of soldiers entered the church, lit a fire and began cooking. He endeavoured to join the soldiers and warm himself up but was ejected by the captain who took him for a beggar. While making his escape from the city, he was seized at the gate, brought back, and identified. He was immediately hanged, his body quartered and decapitated and his head placed over St. John’s Gate, where it apparently remained for several years. Although he was not present for their executions, William Layles, author of ‘Account of Surrender of Limerick, 1651’ ‘hard [heard] for certaine from those that came after me abroad that the Bishop of Imly, Major Purcell, Dominic Fanning, both his sons and his brother … were putt to death’. Hence, it seems almost certain that the Thomas Fanning who owned the land where Mount Ievers now stands was executed by General Ireton shortly after his troops captured Limerick City. Following the Restoration of Charles II, the Fannings were amongst those Catholic families who hoped to be reinvested with their former possessions. Under the Acts of Settlement (1662) and Explanation (1665), many such persons were indeed restored or at least partly recompensed. Thomas Fanning’s heirs was certainly eligible under the terms of the Act as Ensigmen, or one of those who had rallied to the King’s standard. However, there is no record of any Fanning receiving any such compensation. According to the Hon. Robert O’Brien’s notes in ‘The Journal of Thomas Dineley’, ‘Henry Ivers, Gent’ was recorded on Dr. Petty’s Census of 1659 as the Titulado (ie: principal landowner) of Ballymolony in the parish of Killokennedy. [xvi] Ballymolony is located between Sixmilebridge and Cloonlara. In 1661 he was appointed Clerk of Kings Commissioners for settling quit rents, a position which provided him with an excellent opportunity to acquire considerable wealth. He rose through the ranks to become Deputy Receiver. He may have acquired lands in Ballyluddane East, where Mount Ievers stands, as early as 17th June 1666 when a patent was granted to him. In 1667, he was granted over a thousand acres of counties Clare and Galway. In 1673, Henry was appointed High Sheriff of Co. Clare, a position his son and grandson would also fill. The following summer, Lord Clare was appointed commander of a newly raised regiment of foot, Clare’s Regiment of Foot, which was to serve within the Dutch Service. “2 Jas. II. . Order directing Henry Ivers, under penalty of £500, to comply with a Chancery decree in a case brought by him against Donough O’Brien, Daniel Hignett, Ralph Wilson, David Wilson, John Durey, and George Comerford, for possession of the castle, town, and lands of Ballyganner. By the decree, he is to pay the defendants £40 costs. It is stated, inter alia, that ” … Sir Ralph Wilson, deceased, having in  as a Protestant purchaser a dificiency of  acres in … Conought or … Clare due unto him and not knowing where to place them to advantage recommended the same to be done by … Hignett who was then Clarke to the Commissioners in the Court of Claymes who applied himselfe to the complt for directions … promiseing him an advantage for soe’doeing … though the complt had a good estate in fee of the said lands yet to coroborate the same proposed that difficiencyes might be placed on some of them and that … Sir Ralph should passe … six acres in Ballyganner …”. The Treaty of Limerick, signed on 3rd October 1691, permitted the Irish army to go to France. All landholders in Co. Clare who had supported James II were attained for high treason and stripped of their estates. Lord Clare, who had been Henry Ievers boss before the war, was the biggest casualty, losing over 80,000 statute acres. These were presented to the king’s Dutch friend Joost Van Keppel who sold them on for £10,000 to three Protestants who became, with Ievers, part of the new Co. Clare elite – Nicholas Westby, Francis Burton and James MacDonnell. It is notable that Henry Ievers son and heir John was a Colonel in Clare’s Dragoons. 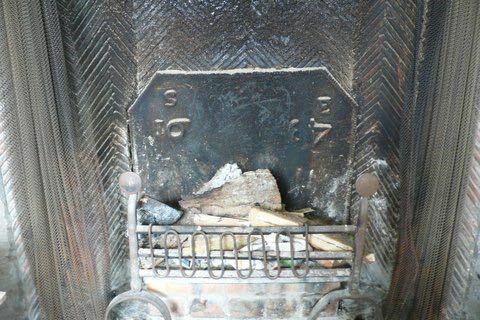 The fireplace dated 1667, the year Henry Ievers was granted over 1000 acres in Clare and Galway.